Hello, dear readers! Today’s lesson will again be dedicated to the theme Mortal Kombat, and the character of today’s lesson will be one of the central figures in the story – Princess Kitana!In this lesson, Princess Kitana will have the classic appearance, which she had in the classic series of the Mortal Kombat. In fact, in the distant nineties, Jade, Kitana and Mileena looks like the same girl, but with different colors of clothing. 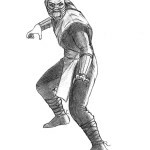 The same technique was used in the design of Scorpion, Sub-Zero and Reptile – in the classic Mortal Kombats it was also the same figure, painted in different colors. Let’s start the lesson, and learn how to draw Kitana. 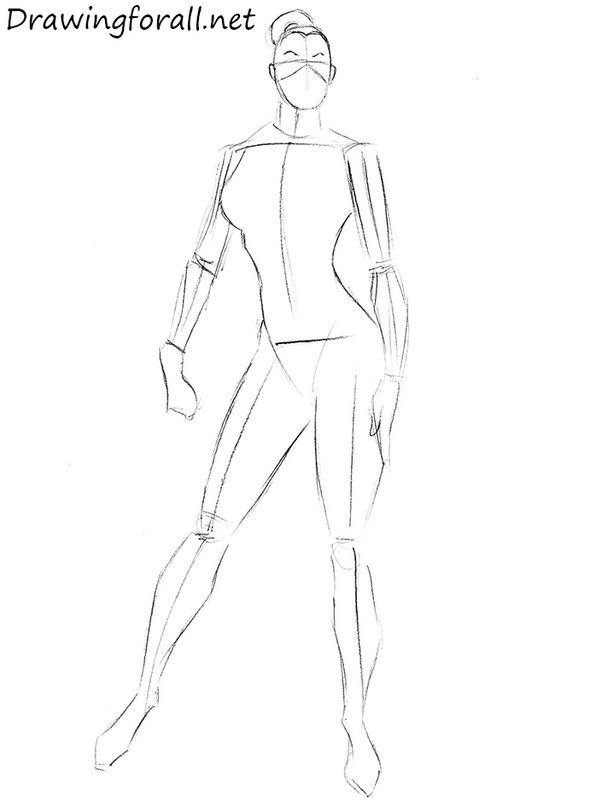 At first we sketch out a “skeleton” of our heroine, that is, the figure made of sticks and circles, by which we designate its position on a sheet of paper, proportions and posture. If we talk about the growth of Kitana, here we can see classic ratio, according to which her height is equal to the sum of the lengths of 8 heads. Note also features figures of Kitana – the width of shoulders and hips of woman are approximately equal, but the shoulders of Kitana a little wider than her hips, due to the fact that she has an athletic build. 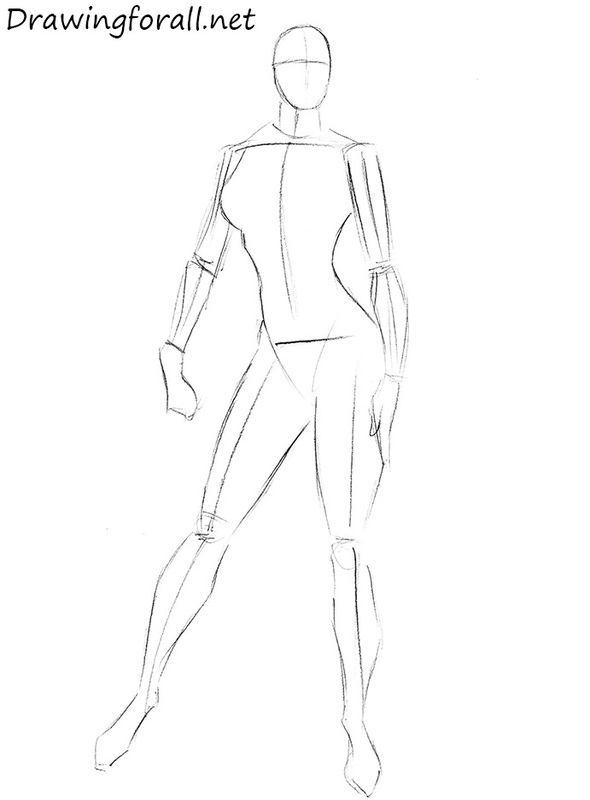 In the rest, you can apply the rules of proportions that we have listed in our tutorial dedicated to how to draw a girl. 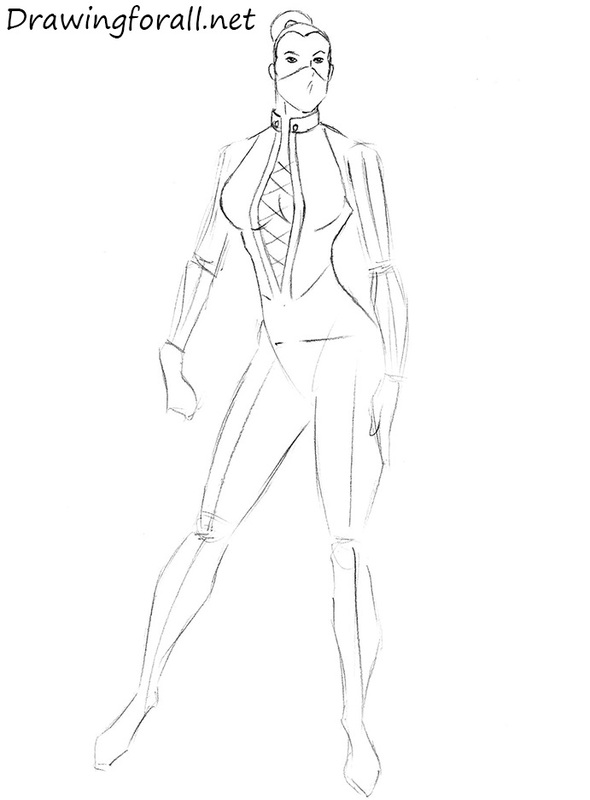 Now we add volume to the skeleton of Kitana. For a start mark up the face, using two lines – the vertical line denotes the eye, and the horizontal – facial symmetry. Then we go down below and using a pair of sloping lines denote the shoulders, combine them with the head using a cylinder, as a guide for the neck. Now, about the area of ​​the waist and legs. Again, note that the body in the pelvic area should greatly expanded. 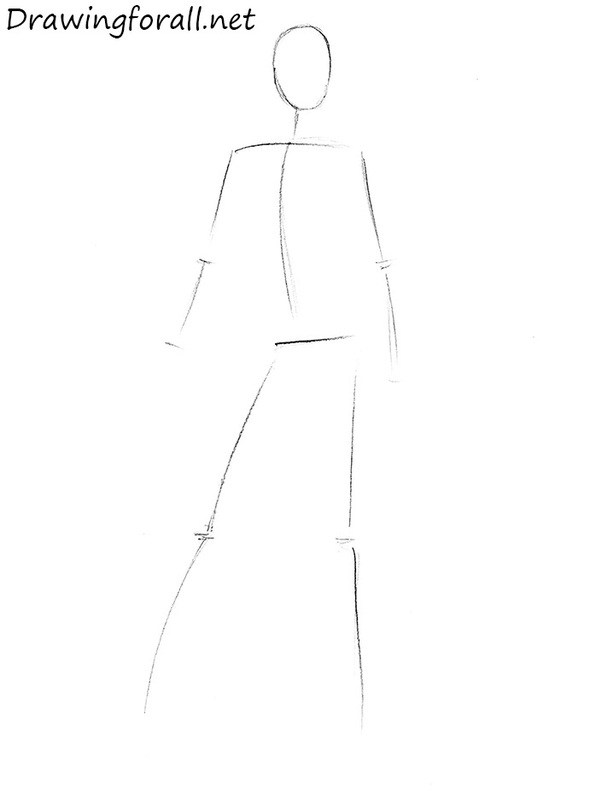 When you draw the legs, in any case, do not make them very muscular – silhouettes of legs should be smooth and feminine. Hips gradually, not abruptly, narrowed towards the knee, then the leg is extended in the area of calf muscle, then narrowed in the area of the ankle. Of course, they need not be massive. 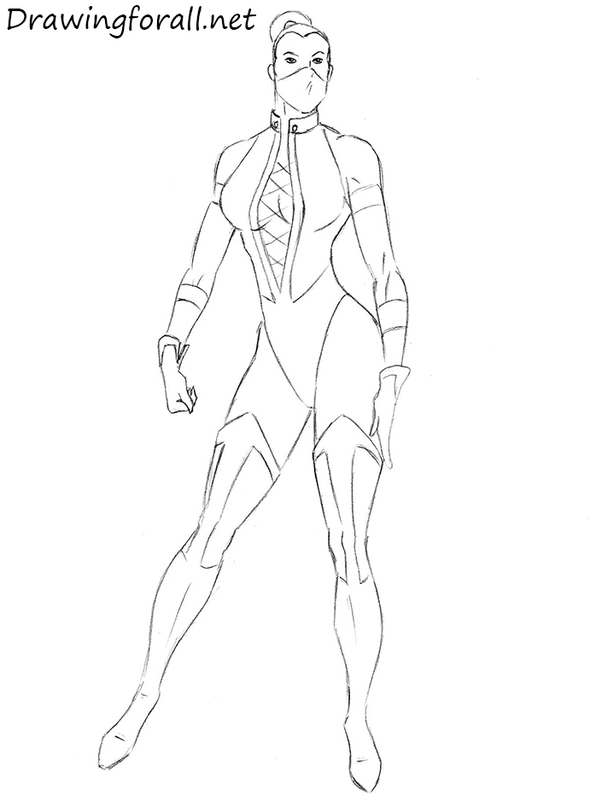 Now we start adding details to the silhouette of Kitana, which we have drawn in the previous step. We will add details from the head to feet, ie from top downward. Using the same method we drew all the other characters. So, using the guidelines from the previous stage, draw the face, outline hairstyle, eyebrows, ears and mask line. If you are sure that everything was right in the previous step, you can erase the guidelines from the face and draw the eyes. On the mask using just three short strokes mark the position of the nose. Circle the hairdo – hair, as you can see, quite tightly pulled into a bun at the back of the head. The head is ready now to begin drawing the torso. Actually, the body outlines we already drawn, you we just need to “dress” it. Kitana costume begins with a collar, which immediately divides into two halves, and then expands in the chest area and narrows sharply downwards. Circle the contours of the breast, draw the details on the torso, such as the lace, which connects the two parts of the costume. 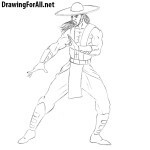 At this step we draw the left arms of kitana. The arms must be quite smooth, but at the same time a little more muscular than arms of an ordinary girl. Quite clearly we can see the deltoids, upper arms and forearms. Add some short lines of muscles. 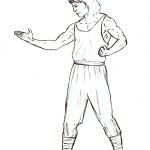 Draw the straps on the upper arms and forearms. Draw the hands, clad in a gloves, and move to the next step. 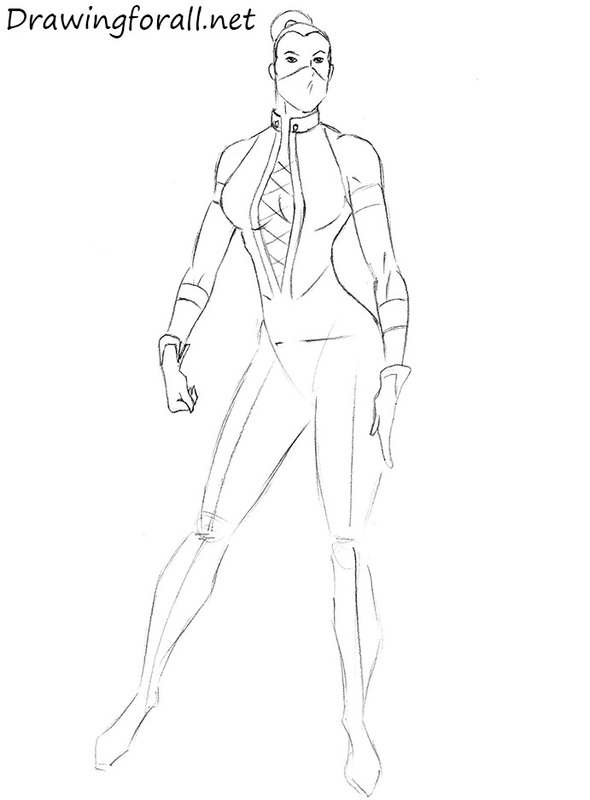 In the final stage of the lesson on how to draw Kitana we draw the legs of our heroine. Actually in this step we don’t need to draw any muscles on the legs (it is still fragile girl, not the Incredible Hulk). 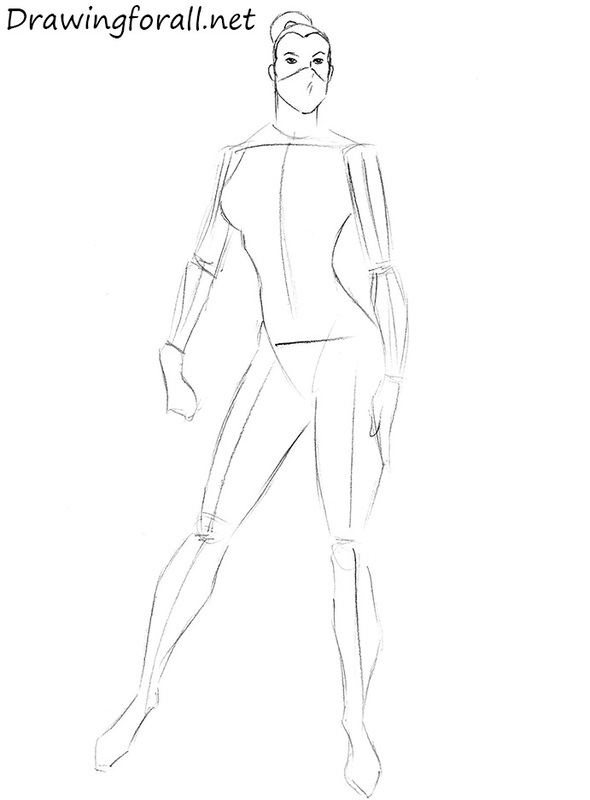 Erase the guidelines and extra layouts from the previous steps, circle the contours of the thighs, legs and ankles. Bends in the area of the knee and ankle should be smooth and feminine, narrowing legs contours should not be harsh. On the high boots draw the patterns in the form of an arrow pointing upward. Therefore, this lesson applies not only to Kitana, but also to Mileena and Jade. 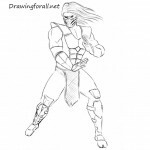 Visit Drawingforall.net often, if you want to see new interesting drawing lessons.